Canada Affidavits. High quality forms. Easy-to-use. Affidavits and Declarations are signed, written statements of fact that may be relied on in a number of legal and business scenarios. An Affidavit is a legal document that allows a person to make declarations under oath. Included are general affidavits, bulk transfer, real estate and name affidavits. Name Affidavit (Canada) This Name Affidavit is designed for use in Canada. This form is available for immediate download. Affidavit of Residency (Canada) Affidavit as to residency of an individual. General Affidavit for One Individual (Canada) A General Affidavit is used to make certain statements in written form under oath. General Affidavit for Two Persons (Canada) A General Affidavit is used to make certain statements in written form under oath. In legal terms, an Affidavit is a written and sworn statement of fact. It is typically made by a person (referred to as an “affiant” or “deponent” depending on the context of the Affidavit) under oath and typically requires a witness to verify the signature. If the affiant is proven to be falsifying facts as outlined in an Affidavit, that affiant may be charged with perjury. Typical Affidavits include voter registration applications, in which it is imperative that the affiant submitting the application is truthful about their information and circumstances so as to prevent voter fraud. Affidavits may also be used in court cases as witness testimony that is given outside of the witness stand itself. When might I be expected to sign an Affidavit? 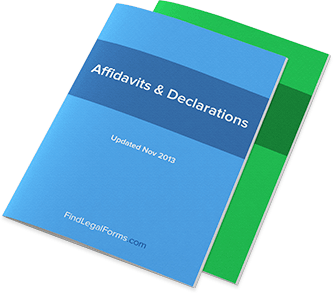 There are a number of unique circumstances that call for the use of an Affidavit. For example, if a witness to a trial is unable to be there personally, it is possible that an Affidavit will be used in a deposition so that testimony can still be given. In such cases, the oath given is still considered valid and the deponent will have committed perjury if it was proven that they had given false information in the Affidavit. A more common use of the Affidavit is in voter registration, wherein new applications will be expected to give their full and accurate information so as to prevent voter fraud. What kind of Affidavits are there? General Affidavits: These Affidavits follow the basic guidelines that you’ve read about above. They’re used to allow a person to make a declaration under oath that certain facts are true, and can apply to a number of situations. Bulk Transfer Affidavits: Designed to conform to the Uniform Commercial Code (U.C.C. ), these Affidavits help protect you and your business’s inventory by declaring what inventory exists. Ensuring that your business remains consistent with the U.C.C. is integral for bulk transfers. Name Affidavits: In this Affidavit, you are declaring that you are the same person but known as a different name, an issue that can arise during complicated legal cases. It will also require notarization. Real Estate Affidavits: Affidavits of both title and appraisal help ensure that a real estate transaction is carried out accurately and that there are no surprises on either end of the transaction – like a Bulk Transfer Affidavit, it is important because a lot of money is on the line. The nature of each Affidavit – a declaration of facts – remains the same across all Affidavits. But as each situation calling for an Affidavit might change, it’s important to use the right form to suit the circumstances. Why is my Affidavit so short? People who have seen a lot of legal documents in their time know that many of them can be long and contain a long list of provisions that can be difficult to understand. In contrast, a General Affidavit is actually a very short, simple, and straight-forward document. The reason for this is that the Affidavit, as a written document, does not have the same validity requirements of most contracts. Because an Affidavit is simply a declaration of facts and not an agreement between two parties, an Affidavit’s role is to spell out who is doing the declaring, who witnessed the declaring, and which facts are being declared. Of course, Affidavits will vary in both Affidavit type (see question above) and how they are executed from state-to-state. Do I have to have an Affidavit notarized? In many states, there are two types of Affidavits: a General Affidavit under Oath and a General Affidavit before Notary. Even if an Affidavit requires a witness to verify a signature, if you are using the former type of Affidavit form, you will likely not have to have it notarized. Even so, it’s important to note that a General Affidavit under Oath, if falsified, will still constitute grounds for perjury charges. How should I word the facts in my Affidavit? Because an Affidavit form will give you a lot of freedom in how you word the written facts, you’ll want to make sure that you do a good job of ensuring that those facts are both accurate and simple. Keeping the language simple will allow you to make declarations that are demonstrably true. It’s important to avoid vague language that is up to interpretation. Be honest and truthful and remember the phrase “nothing but the truth” when it comes to your oath. Plain, simple language is best. When is an Affidavit enforceable? In contract law, “enforceability” is a much bigger concern than it is for Affidavits. Affidavits, however, can be called “enforceable” because of the potential for perjury; if an Affidavit has been proven to be falsified, then the form itself will be enforceable against you, the affiant. Otherwise, without two parties as is the case in a written contract, the notion of enforceability will not have much relevance to Affidavits. What are the requirements for an Affidavit to be valid? First and foremost, the written requirements of the Affidavit must be met. This means that your name, address, county, and facts must be written into the Affidavit, as well as signed. Additionally, someone else must sign the Affidavit as a witness. Because of the difference between two types of Affidavits – “Under Oath” and “Before Notary,” the requirements for your specific Affidavit may vary. In a General Affidavit before Notary, for example, it will be required that the Affidavit be validly notarized. Additionally, the affiant must be of sound mind and under no coercion when signing the Affidavit – this is true for all testimony given under oath. When is an Affidavit effective? Once signed (and, in many cases, notarized), the Affidavit will become effective. It must also be signed by a witness to the signature of the person signing the Affidavit. Provided all other requirements are met, the Affidavit will then be effective.